Once, there lived a great saint, named Vedanta Deshikar. He was very simple had no love for wealth and comfort. He loved to live his life like a religious person, and devoted himself completely to God. Everybody praised him for his simplicity and virtuousness. Each day, Deshikar went from door to door and begged for alms and food. There lived a man in the same town who respected Deshikar a lot and wanted to gift something expensive to him. But he knew very well that he will not accept. 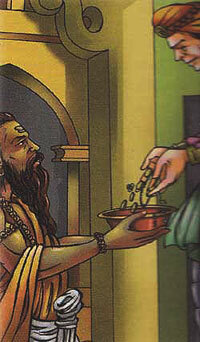 One day , when the sage came begging at the man's door , he put a few gold coins in the rice that he put in Deshikar's begging bowl. Deshikar went home with the rice but when he saw the gold coins he told his wife. "There are worms in the rice. "He carefully separated the rice from the coins away and then ate the rice.